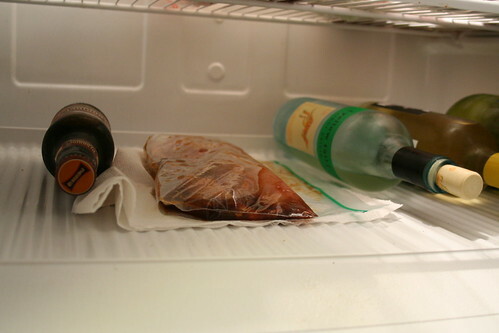 This is the chicken that I cooked last week, marinating in my fridge, along side my last bottle of Redbridge, and 3 bottles of wine. We don't drink much at home, I swear. Summer came around and we thought it would be good to stock up and I guarantee those bottles will still be sitting there in August. Combine soy sauce, lemon juice, garlic, ginger, oil, sesame seeds and onion in large ziplock bag. Put chicken in bag. Marinate for 5 hours. Grill. Serve. Yum. Can you feel my enthusiasm? Here's what I didn't do, I didn't put sesame seeds in it, I used yellow onion instead of green onion and I grated it instead of chopping it. I used fresh ginger but it had been in the freezer, Rachel Ray said it's ok to do that! I marinated over night. It wasn't bad at all, it was good, just a little too much salt and not enough sweet for me. I do have pics of the dinner, I had the grilled chicken, broccoli and Carolina Yellow Saffron rice. Plus the chicken was really thin and I over-cooked it. Hey I'm still learning! I saw today an advertisement on the train that says that Le Cordon Bleu cooking school is now in Boston! Oh how I wish I could go there. eta: next time I think I will try this recipe that was recommended to me by My This & That! hey -- your marinade looks pretty good -- i would definitely add brown sugar instead, and use olive oil instead of veg oil.. did you mince the garlic? green onions will totally help too..
i have an excellent marinade recipe at home, I'll have to check it out. Oh come one...you gotta give me a tiny insy winsy bit of credit. Just a little tiny bit. Tell these bloggers to check out my recipe. I know...it's loaded with sugar. BUT, super yummy! You gotta just go for it. It's marinade, you don't actually eat the cup of sugar. LOL.